Minx (DC Comics), 2008. 152 pages. The Janes are at it again. In this sequel to The Plain Janes, Jane’s group of friends (all named Jane), try to give new life to P.L.A.I.N. — People Loving Art in Neighborhoods — with new “Art Attacks.” However, their funds are running out, the authorities are still against them, and Jane’s Mom reacts badly to news of another terrorist attack. Meanwhile, Valentine’s Day is approaching, and all hearts are turning to thoughts of love, making life that much more complicated. I liked this graphic novel even better than the first. It’s a fun story of a gutsy character, who still believes in her message: Art saves. 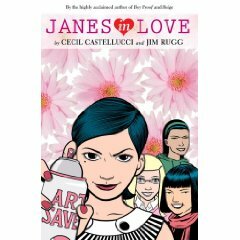 This entry was posted on Friday, November 28th, 2008 at 11:30 pm and is filed under Contemporary, Graphic Novel, Romance, Starred Review, Teen Fiction Review. You can follow any responses to this entry through the RSS 2.0 feed. You can leave a response, or trackback from your own site.